Earlier this morning, I went to the Etobicoke Humane Society to adopt a new cat. I still miss Debug after all these months; but I want to give love to a new furry companion too. 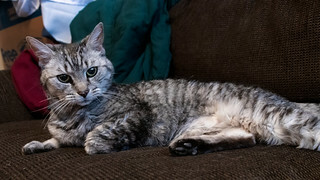 Although I am one of those types that would adopt all the cats if I could, I decided to focus on the older cats at EHS. They had heart-rendering stories. Years with a loving home, but the development of allergies forcing owners to bring them to EHS. Or in the case of “Blanche,” being found outside, severely malnourished and seemingly near death. Blanche’s story hit me hard. She needs anallergenic food as well as medication for hyperthyroidism. I don’t mind the extra cost; giving her a fur-ever home is worth it. While I fell for her immediately, I must confess that I don’t like the name Blanche. I had immediately thought of A Streetcar Named Desire, but the EHS bio for her went with a Golden Girls theme. Since tonight is the premiere for the final season of Game Of Thrones, I pondered a name from the show or books. The obvious names struck me as cliché – Arya, Sansa, Margaery or Daenerys – and I briefly considered Greywind (but Robb Stark’s direwolf didn’t seem appropriate either). My dear friend and fellow cat-lover, Holly suggested Lady Olenna. I loved it. My new furry companion does not have the prickly demeanour of The Queen Of Thorns at all. But her own age and silver regality demanded a fitting name. She is still settling in here. Very shortly after arriving and a brief scouting, she jumped up into my lap while I was watching TV. We’ll figure each other out in due course and share plenty of love over the coming years. Thank you Michael. I am so honored to be consulted. We tossed around quite a few names but Lady Olenna seems the perfect title for her new life with you, her faithful companion. You chose wisely and well. Thank you for opening up your heart and honoring Debug’s memory with another kitty.